1.3 Can I Install One Click Install Links from the command line? 1.4 Can I use One Click Install Links on older distributions? It is no less safe than following a set of instructions for installing software manually. All the same safeguards are in place. You will have to confirm the exact list of changes that will be made to your system before you give the installer permissions to install the software. 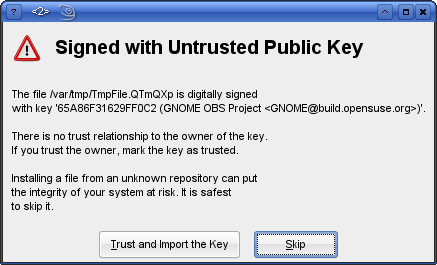 You will also be asked to confirm that you trust any software vendor that you have not previously trusted. It is certainly not safe to blindly install software you do not trust, or know the origins on your computer. This applies to any method of installation. One Click Install is no less safe than any other method, except that by making it easier to install software there is a greater risk that users will not check what they are installing. There are things that can be done to make things even safer in the future. For example, the keys the packages are signed with could be looked up online, and if the key holder has a poor reputation the user could be warned. Have a look at the proposed solutions and pick the one that seems best. Often these conflicts will simply be confirmation requests for changing the vendor of an already installed package. If you save a list of any conflicts you get, and send them to the person who supplied the one click install link, he or she may be able to modify the instructions file or the packages themselves to avoid the conflicts in the future. Can I Install One Click Install Links from the command line? It behaves in a similar manner to the GUI interface, asks you to confirm changes, and then prompts for the root password. Currently it is not possible to customise the proposal in the command line interface. If you want to have the command line support on openSUSE 10.3 you can install the updated one click install handler. Can I use One Click Install Links on older distributions? It is possible to install the one click install client on openSUSE 10.2, and SUSE Linux Enterprise Desktop. To do so you need to add the openSUSE:Tools repository to YaST/zypper Add package repositories to YaST and install the yast2-metapackage-handler package. This page was last modified on 10 December 2012, at 23:05. This page has been accessed 29,320 times.